The simplest way to manage your cards. Register, check your balance and view recent activity all in one place. Click on the image for more information. Gordie's Garage is a full service auto repair facility servicing the Roseville, MI and Metro Detroit area. Established in 1980. 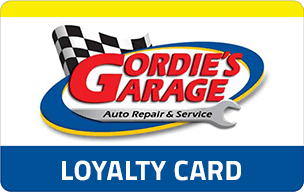 Gordie’s Garage has been in the Roseville, Michigan area since 1980. Committed to the best service, repair and maintenance of your vehicle, our team of ASE Certified Technicians can work on anything! Family owned and operated for over 35 years, our shop offers a 2 year/24,000 mile warranty. Come by our shop today and spend your time in our nice waiting room filled with coffee, snacks, bottled water, tea, and Wi-Fi! Call and set an appointment today! Thats why at Gordie's Garage we offer a free ride control analysis. Our technicians will test drive your vehicle and perform a free hoist inspection of your suspension system. When the ABS brakes are not working properly the ABS light will remain illuminated. When this occurs the ABS brake system is deactivated. You can be rest assured that we are fully trained and have obtained the latest in diagnostic equipment to handle just about any vehicle on the road today. Over time corrosion accumulates on the battery posts and terminals to the degree that this build-up begins to drain power from the battery. Our full service oil change consists of a routine inspection, lube chassis, new oil, new filter, fill tires to the proper specs and top off the required fluids. The purpose of automatic transmission fluid is to lubricate, clean, cool and provide the hydraulic pressure necessary to ensure smooth operation of the vehicle. When your vehicle has a tire pull, tire wear, off center steering wheel or sometimes a vibration while driving it may be time to have your alignment checked. No Interest if Paid inFull Within 6 Months on Purchases of $299 or More. - Get 6 Months Special Financing on purchases of $299 or more. 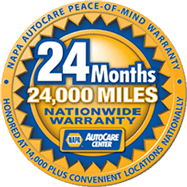 - Get 2x the Peace of Mind Warranty (24 months or 24k miles). - Use your EasyPay Card Again and Again for all your future auto repair needs.